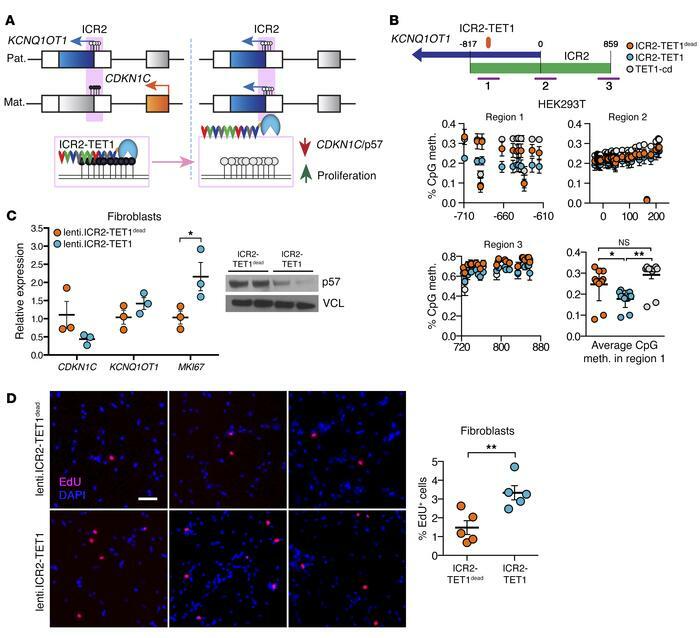 Targeted demethylation of the ICR2 at the CDKN1C/p57 locus causes increased proliferation of human fibroblasts. (A) Schematic of the imprinted chr11p15.5 locus. The ICR2 is methylated (depicted by black circles) at the promoter of the long noncoding RNA KCNQ1OT1 on the maternal allele, and correlates with maternal allele–specific expression of CDKN1C. A TALE-TET1 fusion protein was designed to target the ICR2 and remove the methylCpGs at the ICR2 in order to deactivate CDKN1C and increase cell proliferation. (B) Three regions within the ICR2 were amplified for methylation analysis by targeted bisulfite sequencing. Percentage CpG methylation at 3 regions of the ICR2 are shown (n = 3 for each condition). (C) p57 mRNA and protein levels in fibroblasts overexpressing ICR2-TET1dead or ICR2-TET1 (n = 3 for each condition). VCL, vinculin. (D) EdU incorporation in fibroblasts 72 hours after transduction with the ICR2-TET1dead or ICR2-TET1 lentivirus (n = 5 for each condition). Scale bar: 100 μm. *P < 0.05; **P < 0.01 by 1-way ANOVA (B), 1-tailed t test (C), or 2-tailed t test (D). NS, not significant.